Poker has been the #1 thing on my mind the last couple of weeks. Basically since the leaderboard promo all I could think about was poker. Sitting in the train to work, on the couch with my girlfriend or just before I went to bed, I had that itch again and although I’ve never been fed up with poker it was a long time ago since I had that itch. Poker has become more “work” then “hobby” and seeing it more as a hobby sometimes can only be a good thing, since who really likes work? 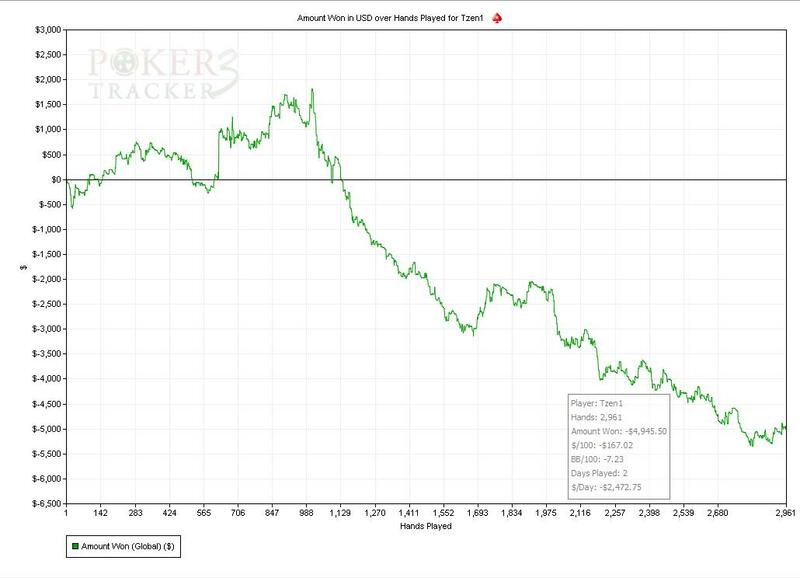 I’ve looked a lot at “Open Raise” ranges per position and especially at 3-bet ranges preflop. 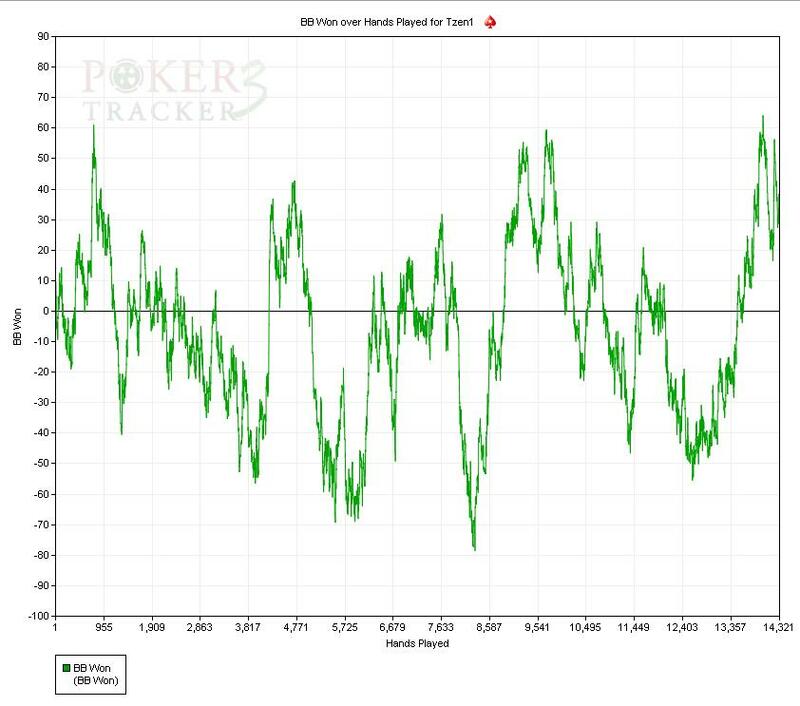 I’ve analyzed many winning players and have completely changed my PokerTracker HUD. I’ve worked out which stats I find useful when playing. Per stat I’ve assigned 3 colors, green means average, red means to passive and/or tight and orange means to aggressive and/or loose. I have RFI/3bet% per position stats, a lot of stats about flop/turn play and blind steal/defense situations. For some time now I’ve also been paying a close watch to the “higher” games, 15/30+. These games basically run almost all day but it isn’t that simple. The games only run when there is at least 1 fish sitting in, you never see a table with 6 good regs. This might sound trivial but at lower stakes you often see 6 regs sitting at one table just because they are probably mass-tabling or just are not aware they don’t have an edge in that specific line-up. It doesn’t make sense to grind a game with 5 other good regs, there might be a small difference in edge but this probably most of it (if not all, especially at lower stakes) is taken away by the rake that needs to be paid. Still these midstakes games run often enough which means there is enough fish that keeps these games going. It’s just extremely important that you know who the fish is and if you can act quick enough, take position on them at the tables. It’s really a bumhunt game and there are many regs who are doing this. At the High Stakes it has become a game where most players are waiting more then half of their time most of the days. Assigning colors to anybody I come across really helps when you want to bumhunt so as already mentioned this is really a must. So after doing all of the above it was time to test the waters. I played a couple of session of $2/$4 6-max and at first I had to get used to my new routine. My HUD had changed dramatically, I didn’t want to sit at tables with 5 other good regs so I had to pay a lot more attention to the lobby to keep playing at soft(er) tables and because of that (but also because I wanted to) I played less tables at the same time. 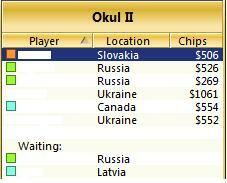 I kept it at roughly 10 and where normally I get bored with playing “only” 10 tables this time it was different. Because I had more information at hand at the tables I had a lot less idle time since with this extra information I needed a little more time to make my decisions. Together with keeping track on what happens in the lobby this means I could play less tables, remain focused and probably make better decisions in some situations with the extra information at hand. I played 14k hands, with the regular swings I was up a bit and was pretty happy with the changes I made to my game. Then on Saturday night I came home pretty early (01:00) and looked at the lobby. I saw some pretty good tables with 2 bad players and 3 good regs but not the best ones. So these people are winners in the game, but not by that much. With some decent seat selection I should be a winner in these games so I decided to give it a go. After being up for most of the session I finished up only $100 but with the small sample I couldn’t really complain. What was more important was that I felt pretty confident at the tables and it tasted like more. I enjoyed myself all day at FC Utrecht. I didn’t see a live match for a long time and I really loved to see one again. Unfortunately the match ends in a draw after Feyenoord already taking the lead in the 1st minute of the match. 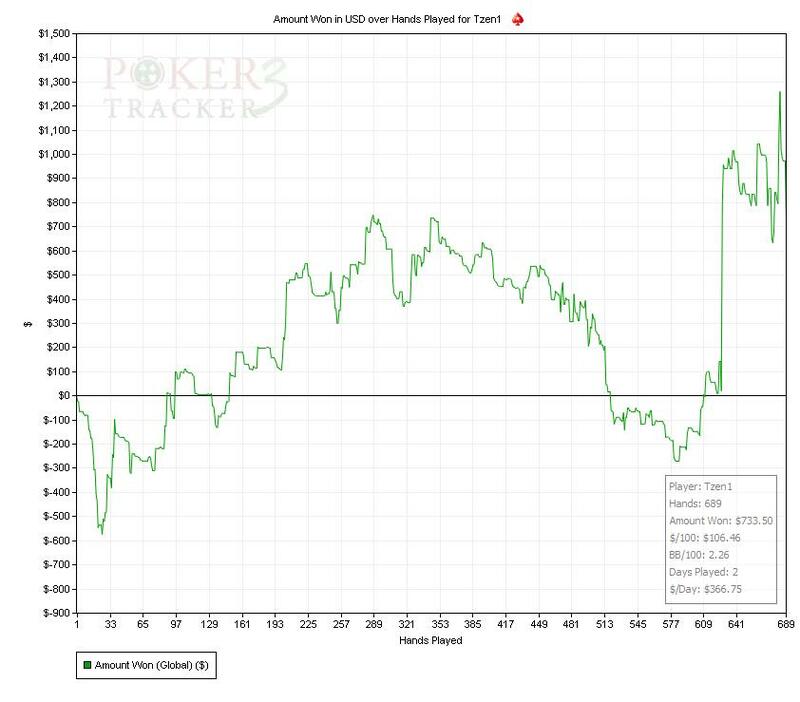 I’m happy to get home for what will be my first real evening of grinding the mid-stakes. It starts with some real good $10/$20 games a $15/$30 and even a $30/$60. I’m up another $1.000 quickly and keep looking at the lobby on what’s happening. There are a lot more good pro’s waiting in the queue so you need to act quicker to join the tables. Also the line-up is most of the time tougher then I played earlier. The regs are better and the fish is not as fishy as the guy who played all night for example. However I feel pretty good about most of my game and I’m up about $1.700 at the top. From there on I manage to hardly win a pot for about 600 hands and at the stakes I’m playing that means burning money. I’m all of a sudden not so happy anymore but keep my cool pretty good. I’m not really thinking about the losses and just tell myself this is the variance you will have to deal with. If you can’t handle the swings, don’t play the game and I’m not really bothered with the swings. A $100/$200 game just starts with a pretty well known bad player which almost keeps the High Stakes LHE games alive by himself. I can get direct position on him and ponder if I should join. I sit in, think about quitting all the other tables but chicken out eventually. $50/$100 might have been doable but at that moment I was already down $5.000 from the top and decide that although EV wise it might be a good opportunity, I would pull my hair out of I lose $10k in 1 day, which is easily doable when playing $100/$200. The next guy in the queue probably would have paid for my seat but well, I’m just not all of a sudden good enough to play a game that high. I continue to play $10/$20 and $15/$30 tables but it doesn’t really seem to matter what I do. I just get beaten out of every pot. I never manage to get a proper streak going and after checking PokerTracker and seeing I’m almost down -$5k in total (both days combined) I feel pretty disappointed. I’m pretty sick about what happened. The money is one thing but the fact I lost plays a bigger part. It’s only a 3k sample so I’m not sure what to make out of it. Is this variance? Looking at how steady the line goes down I would think it isn’t but on the other side a -7BB/100 winrate is something even the worst regs don’t have. So for sure some part is variance, probably a big part of it is but that still doesn’t mean I should have been a winner in these line-ups. Taking shots and winning makes it all seem so wonderful but after losing like this it really becomes hard to decide on what to do. I just don’t have another $5k to spent on finding out which probably means I shouldn’t do it anymore. That however makes these losses pretty “final” while normally I consider losses just a temporary evil which comes with winning in the long term. Sure jumping from $2/$4 to $30/$60 doesn’t sounds like the smartest plan in the 1st place but I still think that some of the $2/$4 tables are a lot tougher then the $15/$30 tables I played. A fish at $2/$4 is often trying his best in poker but just isn’t good enough (yet), many fish at $15/$30 just have to much money and want to gamble it up. Sure the regs can be tougher but sometimes you play the exact same regs so it’s all about table/seat selection. For now I’m not going to join these games for at least some time. I’m going to do the one thing I skipped and that’s watching training video’s which should help me to improve my game. I think all the effort I’ve put into my game is going to help a lot but I’ve probably should have waited a little longer to take these kind of shots or at least consider it as taking shots and only pick out the best of the best “bad” tables and not just any table with 1 bad player. In hindsight it’s all so easy and although it will take some time to grind back the money, I probably learned a thing or two off it. I have plenty of other things I want to blog about but I just never seem to be able to keep these blogs very short. Coming weekend we have the 10th Anniversary Sunday Million which had a guarantee of $10.000.000 and a first price of $2.000.000. We’ve seen a lot of crazy promotions lately by PokerStars but getting 50.000 players to play the Sunday Million is nuts as well. I’m however happy to take it down so hope to see you all playing next week. I’ll have to grind another 10.000 VPPs before I’m really done for this year and I’ll probably write one last blog somewhere at the end of the year before being on holiday for almost the complete month in January. (I just booked my ticket to the PCA, but more on that in my next blog). 3k hands is just variance. I mean, of course, it might be, you were loosing in that game, it’s even more probably then you were winning, looking at the results. But that probabilities don’t really matter in that small samplesize, the longterm winrate can be everything.